Simply Nerdy Mom: 5 Important Things You Can Learn From Couples Therapy! 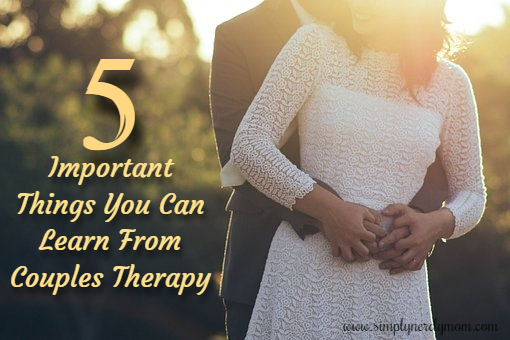 5 Important Things You Can Learn From Couples Therapy! You may be asking yourself if couples therapy is even really worth it, but believe it or not, there's a lot you can take away from a few sessions with a couple's therapist. In a world where everyone calls it quits far too quickly, let me tell you all the things you can get out of therapy that may just help salvage your relationship. You've probably heard it before; that old saying about never going to bed angry and how it's the key to a good lasting relationship. However, let's be honest, when you live by this rule, often times someone ends up just settling and agreeing just to prevent the argument from carrying on, and really, that helps no one. A real solution will never happen in that situation. You would be surprised to find that you may have a much clearer mind and can come to some agreement once you've slept on it. Truthfully, this works for me. I've always been one of those people who prefers to walk away from a disagreement for a period of time just to give myself time to cool down and think things over. Once I've done that, I can come back and have a productive conversation with the other person with a clear head and cool temper. It really does help. I know you may be thinking, "How could you forget something like this? ", but trust me, you definitely can! This is especially the case if you've been together for a decade or more, or just tend to fight a lot. Often you may find yourself trying to remember what it was about your significant other that made you fall in love. In Couples Therapy, you will often be tasked with expressing what it is about your partner that you like, what made you attracted to them, and ultimately why you fell in love. This is a vital part of repairing the cracks that may have formed in the relationship and within ourselves as well. You may not realize it, but we generally tend to point blame when we are expressing to others how they may have hurt us. Using what professionals call "You" statements can make the other person feel attacked and therefore, they have reason to get defensive. A better approach is to start using "I" statements. Okay, so for example, if your significant other has made you feel invisible lately due to their hectic work schedule, instead of saying "You have made me feel invisible because you have been preoccupied lately", you could say "I feel alone/invisible to you when you work so much." By swapping out that one word, you express your feelings without placing blame. If you have never had an argument in your relationship, you may think it's because you just get along so well. However, the reality is probably that at least one of you is holding something back. Remember that it's okay to have disagreements or argue. It's healthy. If something bothers you and you choose to brush it off because you don't want to start an argument, you are doing a great disservice to yourself and your relationship. Not only should you feel appreciated, respected, and comfortable in a relationship, but your partner needs to know when you are unhappy. How will they ever know something needs changed or improved upon, if you don't tell them? As long as you articulate your frustrations in a respectable manner and keep your emotions in check, this is a healthy way to solve a problem or at least start on the path to a resolution. No matter how long you've been together, it's always good to hear compliments from our significant other. When we go a long time without hearing an endearing compliment it can seem like maybe we aren't good enough or unappreciated in some way. For instance, if your husband usually doesn't help out around the house and he decides to do the dishes, definitely make sure you thank him and compliment him. This makes him feel appreciated and he will be more likely to start doing things like this more often. That's just an example, of course, but if you incorporate this idea into other parts of your relationship and try to compliment your partner at least once a day, you can make them feel loved and boost their self esteem, which helps boost the relationship overall. All of these are just a few simple things you can learn from couples therapy, but there are many more positive lessons that will strengthen your relationship. For more tips on getting your relationship back on track, visit this link.